Banff and Buchan MSP Stewart Stevenson paid a visit to Home-Start Deveron in Banff earlier today as he participated in CSV Make a Difference Day. CSV Make a Difference Day remains the UK’s biggest single day of volunteering action and activities range from environmental clean-ups to integrated events involving children with learning difficulties, and from special tea parties arranged for older people to complete renovation and renewal of community facilities. Home-Start Deveron volunteers provide support for families with young children who are experiencing difficulties, providing friendship, practical help and support. Banff & Buchan MSP Stewart Stevenson has secured an assurance from Environment and Rural Affairs Minister Ross Finnie that working fishermen be consulted during the Fisheries Council in Brussels in December before any significant decision affecting them were made. The SNP MSP challenged Mr Finnie at Question Time in the Scottish Parliament today. "After last year's debacle over area boundaries, where a brief glance of the map by any working fisherman would have revealed them to be impractical and incorrect, this is a move in the right direction. "Only by ensuring that real life experience is part of the decision making process will we avoid such obvious errors in the future. Banff and Buchan MSP Stewart Stevenson has signed a Parliamentary Motion highlighting the importance of Energy Efficiency Week which runs from Monday 25th October to Sunday 31st October. “The Energy Efficiency Week which is organised by the Energy Savings Trust, is very important indeed. In society today, many people are failing to link energy use with its effect on the environment and that every year thousands of tonnes of extra carbon dioxide are produced to create energy that is consequently wasted. “The time has come for each and everyone of us to get involved in saving energy by turning off lights in unoccupied rooms and turning off at the plug electrical appliances that are not being used. The Rev Pauline Steenbergen: Speaking on the radio, an Iraqi woman living in Glasgow burst open my sleepy eyes. "Your country is stunningly beautiful," she said. "Every day here, I see new shades of green." Those comments opened my eyes and changed the way in which I saw my own land. Look out of your windows and see a stunning Scotland in full-blast autumn colour today. There is plenty of beauty in rough, rugged Buchan, where I live. Not wild waves, biting winds and thick haar, but the people, language and culture are its treasure. Every day at bus stops, in playgrounds and in post offices, we see huddles of human beings doing what they call in Doric "haeing a news". A rough translation is "stopping what you are doing, standing still, listening and communicating". In Buchan, news travels fast. Where I minister, in Crimond, which is famous for writing the melody for psalm 23; in St Fergus, which is associated with the gas terminal; and in Lonmay—where the granda of Elvis was from—I often hear what is going on in my life or my manse long before it even happens. If I stopped speaking, if we mingled for a moment in the chamber and if we reflected together, what is new for you? What letters, e-mails, phone calls or conversations burst open your eyes this morning? What is new for you in a new building and a new era? Who is new? If you and I are truly agents of change—bringers of a new nation—what new things do we long for today, fight for this week and pray for this year for the people whom we serve and the folk whom we love? Most of all, what desires do you and I have for change deep within ourselves? "Cease to dwell on days gone by ... don't brood over past history. Here and now I will do a new thing ... it is happening already." This autumn, something new has the power to remodel you and me and thereby refashion our Scotland. "Embrace the new whole-heartedly," Jesus said to his pals. "No one uses a new piece of cloth to patch up an old coat. No one pours new wine into fusty old wineskins." Well, Jesus did not say that, but he would have if he had been from the north-east. New wine requires new wineskins. What will 27 October 2004 bring you and me? Let us see, hear, taste, touch and smell a Scotland where every day there are new shades of green. Banff & Buchan MSP Stewart Stevenson will welcome Rev Pauline Steenbergen to Holyrood this Wednesday when she will lead the Scottish Parliament in ‘Time for Reflection’ before the Parliamentary business commences. Rev Steenbergen is currently filling in at the vacant charge of St Fergus, Crimond and Lonmay and is well known locally. “I am delighted that Pauline will be leading the Scottish Parliament in ‘Time for Reflection’ so soon after we have moved into the new building. “I believe also that this is the first time that the Minister from Banff & Buchan has led the prayers in Parliament so I am doubly delighted by Pauline’s attendance. “The findings of this report suggest that there are still major problems with the processing of cases through the High Court. “The Lord Advocate set these targets to restore the public’s faith in the judicial system, and while these may have been met in some areas, only just over half of the most serious cases have been brought to court within the 9 month guideline. “The fact that some of the most serious cases are being delayed will be of little comfort to those who have been affected by these crimes. “The purpose of the time limit is to prevent injustice and ensure that the Crown Office and the Procurator Fiscal Service prepare cases quickly. “This is an A1 report, which has been achieved due to the immense dedication and enthusiasm of the headteacher and staff at Mintlaw primary. The school is leading the way in providing a very high standard of education. “Numerous key strengths were identified during the report and I am sure that the efforts of all involved at the school has not gone unnoticed by parents, nor the wider community. Shadow Rural Affairs Minister and North East SNP MSP Richard Lochhead and Banff and Buchan SNP MSP Stewart Stevenson have hailed their farmers surgery earlier this week in Turriff a success. Farmers from across Banff and Buchan and Gordon used the opportunity to raise a range of pressing issues with the two MSPs who have in turn pledged to raise them in the Scottish Parliament with Rural Development Minister Ross Finnie. Such issues range from the rising cost of fuel and fertiliser to the need for measures to attract new entrants to the sector. "There was unanimous concern expressed over the impact rising fuel and fertiliser costs that threaten to cripple local farming operations. One farmer told us his fuel costs had risen by 40% and fertiliser by 30% in the past year alone. No wonder, farmers are waiting nervously for their next set of accounts. "The running sore of the beef national envelope continues and it is opposed not only by farmers that expect to lose out, but by those who expect to benefit financially and that speaks volumes about this controversial decision. "We have also agreed to investigate the potential for biomass and biofuels as an extra source of income for farmers and a means by which they may be able to access cheaper energy in the future. Stewart Stevenson and I will be raising these issues in Parliament and also at a forthcoming meeting with Ross Finnie." "Despite the very real challenges that face the industry, farmers are optimistic that if the policies are right then farming in the North East will prosper. However, measures have to be found to attract new entrants to the sector and to attract the necessary skills that are required in modernising farming. "If the supermarkets were able to pass on some of their profits down the supply chain then farmers would receive more of a reward for their produce and that is something that has to be revisited. Questions arose over the effectiveness of the Code of Practice signed by the supermarkets as farmers are not all getting a bigger slice of the cake and part of every pound between the farm gate and the plate remains unaccounted for." SNP Spokesperson for Drugs Policy and Prisons Stewart Stevenson today welcomed the report published today by Professor Neil McKeganey at the Centre for Drug Misuse at Glasgow University on the use of methadone when treating drug addicts. Speaking following the publication of the report, Mr Stevenson highlighted the continuing problem of access to rehabilitation services for addicts, and stated that this must be the first priority for the Executive in this area. "While I welcome the publication of today's report, it's clear that the major challenge in this are is the lack of places on rehabilitation programmes for drug addicts. Waiting lists for rehab places, whether they are for abstinence or methadone based programmes, continue to be a huge barrier to combating Scotland's drugs problem and the Executive should act now to sort this out." "Treatment for addicts should be provided on the basis that each individual should get the best programme for them. But this requires a mix of different programmes across Scotland and this is simply not happening." "For example, Prison Governors are facing budget cuts at the same time as our prison population is rising, which impacts severely on their ability to fight the scourge of drugs in prisons." "The Executive is failing us all by its inability to provide enough rehab places." Cornhill Post Office® re-opens on Monday 18 October in the former Police Station at Knock View, Aberchirder Road, Cornhill and gets a stamp of approval from MSP for Banff & Buchan, Stewart Stevenson. The Post Office® will be open Monday, Tuesday, Wednesday and Thursday from 9.00am to 12.00pm in refurbished premises and will be run by the new sub-postmistress Mrs Veronica Irvine. Mrs Irvine has lived locally for nearly 30 years and is well known by the local community. She will run the office from the former Police Station alongside her B&B facilities. “This is excellent news and I am delighted that Cornhill, Ordiquhill and district is getting its Post Office back. “Post Office® services are at the heart of every community, particularly in more rural locations. We work extremely hard to keep services in rural areas and wherever there has been a period of closure we do all we can to ensure customers have access to Post Office® products are services as quickly as possible. Commenting on the publication of the Chief Inspector of Prisons Annual report this week, local MSP and Shadow Deputy Justice Minister Stewart Stevenson said that it comes as no surprise that there has been little improvement due to the blight of slopping out and prison governor’s budgets being cut. “We have just learned that there are a record number of prisoners in our jails. So it is no surprise that HM Chief Inspector Andrew McLennan is saying that prison officers and prisoners agree that over-crowding is the number one issue in prison. “But with slopping out still a blight on our prisons and governors’ budgets being cut it is no surprise that we see no improvement. “One area where we can make a short term improvement for society is in the area of prisoners with drug habits. Many users only end up in prison because they cannot get a place on rehab programs. “And those that come out with their addiction controlled through what the Inspector describes as ‘an impressive range of interventions’ often return to their chaotic lifestyles because no arrangements have been put in place for continuing treatment after release. “It is time for real progress. The Inspector’s report repeats many of last year’s criticisms. We cannot have another year like this. “On Peterhead Prison specifically, the cut in the Governor's budget will make it difficult to provide adequate support for the programs for which Peterhead is justly famous. Holiday periods must also be better resourced so that prisoners are not simply locked up for long periods doing nothing productive to address their behaviour. Banff & Buchan MSP Stewart Stevenson has written to Rural Affairs Minister Ross Finnie with concerns that planned regulations on water abstraction for agricultural purposes will mean an increase in red-tape for farmers. Mr Stevenson wrote recently to NFU Scotland branches in his constituency with his concerns and invited feedback. NFU Scotland nationally have made a submission to the Scottish Executive with detailed proposals for minimising the effects the planned regulations will have on farmers and Mr Stevenson has lent his support to this move. “It does strike me that this is yet another layer of administration that some farmers will be forced to deal with, which concerns me. When I was first elected, I visited a farmer who raised the subject of ‘red tape’ and administration with me and I asked him to give me a practical example by showing me the paperwork relating to one animal. The paperwork he showed me took up the entire length of his kitchen table and ever since then, I have been very conscious of the amount of time our farmers have to spend on paperwork”. “I have had sight of the submission made to your department by NFU Scotland and can tell you that this accurately reflects the views of those farmers in my constituency who have either contacted me specifically on this matter, or raised it in passing. Banff & Buchan MSP and Shadow Deputy Minister for Justice Stewart Stevenson attended a Children’s Hearing session in Aberdeen this morning at the invitation of the Scottish Children’s Reporter Administration. The Scottish Executive is currently conducting a review of the Children’s Hearing system and Mr Stevenson was keen to see it in operation and meet with staff involved. “This was a very useful insight into what may actually go on at a Children’s Hearing as I suspect many people, MSPs included, do not actually have a clear picture of the processes relating to social work and juvenile justice. “It is clear that the staff involved are striving to achieve the best possible outcome in terms of both the individual concerned and the wider community and their dedication to this shone through. MSPs to Hold Special "Farmers' Surgery"
Banff & Buchan MSP Stewart Stevenson and Shadow Rural Affairs Minister Richard Lochhead MSP are to hold a special open meeting specifically for local farmers. The SNP MSPs will be available to hear the views of local farmers on a range of issues on Monday 18 October in the Union Hotel, Turriff at 7.00pm. “This idea basically came about because of the wide range of farming-related issues which both Richard and myself have been dealing with over the summer. “There are several issues causing concern at the moment to farmers such as the Beef Envelope plan and water abstraction regulations which both Richard and myself have raised with Ross Finnie. This will be an opportunity for farmers to feedback on the responses received from Ministers and to further develop the arguments we need to take to the Scottish Executive on these and other issues." “I am looking forward to this meeting, particularly since I am now the Shadow Minister for Rural Affairs. “I am keen to engage with all sectors of the farming community to allow me to effectively represent their views in Parliament. As a North-east MSP, I have always taken a keen interest in farming issues, indeed, due to my Constituency Office being located in the Thainstone Centre I am now ideally placed to meet members of the farming community. 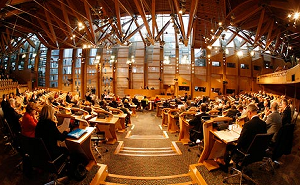 Banff and Buchan MSP Stewart Stevenson was guest speaker at a recent event to raise awareness of autism. Autism is a lifelong development disability that affects the way an individual communicates and relates to people around them, for which there is no cure. “Autism sufferers face all sorts of difficulties in their day to day lives as it can severley cause problems with their social interaction, their inability to read situations and the difficulty of understanding others’ feelings or experiences. Due to the fact that the exact cause of autistic spectrum disorder (ASD) is still not fully known, getting the right kind of help and support is crucial for individuals with an ASD so that they can go on to fulfill their potential. “It is clear as we learn that many sufferers are not diagnosed until well into their teens, the area of diagnosis is an area which should be given priority. Also, once diagnosed, more has to be done in the area of post-school suport for adult sufferers so that they can be provided with a vital source of support rather than simply left to their own devices once they have completed their education. “Obviously, more research is needed in the area of Autism and service providers such as health, education and social work need to forge together to ensure that sufferers are given every opportunity in life that most of us merely take for granted. Although the Scottish Executive do have policies regarding this subject, it is clear that not much is being delivered. “Individual sufferers need to be consulted more as it is them who know at first hand the problems and the key issues therefore they need to be involved in the process of service provision. “From attending this event this evening, I am pleased to hear of pilot projects which have been launched to ensure early intervention and quick diagnosis of sufferers will previal so that their needs can be met and I wish the projects every success. Banff and Buchan MSP Stewart Stevenson, along with South of Scotland MSP Adam Ingram were the speakers at an event organised by the Scottish Association of Mental Health (SAMH), which focussed on the issue of mental health, highlighting the Mental Health Act which is due for implementation in April 2005. “With the recent results of a survey finding that one in four of us will be affected by mental health and the staggering statistic that Scotland has the most highest rising rate of suicide in young men within Europe, it is vital that the Mental Health Act, when implemented, does in actual fact address these very worrying facts. “The Scottish Executive seem to believe that by simply introducing legislation they are solving all problems when this is not the case – the job is far from done once the legislation is introduced. What I find slightly worrying is the lack of trained individuals working in the field of mental health services. Today, we are seriously lacking people going in to the profession such as pyschiatric nursing and this trend needs to be addressed now. All steps must be taken to encourage people to train in the mental health service sector and to seek employment in our country once qualified. This must initially be done at school level by showing that this area of employment can be very rewarding emotionally and the importance attached to it. Commenting on the publication of the Chief Inspector of Prisons Annual report today (Wednesday), Shadow Deputy Justice Minister Mr Stewart Stevenson MSP has said that it comes of no surprise that there has been little improvement due to the blight of slopping out and prison governor’s budgets being cut. “We have just learned that there are a record number of prisoners in our jails. So it is no surprise that Andrew McLennan is saying that prison officers and prisoners agree that over-crowding is the number one issue in prison. “One area where we can make a short term improvement for society is in the area of prisoners with drug habits. “Many users only end up in prison because they cannot get a place on rehab programs. Banff & Buchan SNP MSP Stewart Stevenson has commented on the First Minister’s Cabinet reshuffle in which Malcolm Chisholm has been demoted and Andy Kerr becomes the new Health Minister. “Only a few weeks ago, Jack McConnell’s office was insisting that there would not be a reshuffle this year. Now, after a summer dominated by public fury over failed policies – particularly hospital cuts and closures – panic has set in. “Jack McConnell has demoted and sacked ministers but until he ditches his failed policies, the public will see little difference. Banff & Buchan MSP Stewart Stevenson has welcomed the news from the Principal of the Scottish Agricultural College (SAC) of the new business plan for the Craibstone facility near Aberdeen. There had been concerns for some time now that both the Craibstone campus and Auchencruive in Ayrshire would be closed and the SAC centralised in Edinburgh. Now, in a letter to Mr Stevenson who has been working alongside Craibstone’s MSP Brian Adam to secure its future, SAC Principal Professor W McKelvey has confirmed that education, consultancy, veterinary centre activities and a research and development team will be maintained in Aberdeen. “In broad terms I welcome the news from the Principal about the business plan being proposed for Craibstone which sees core activities maintained and building improvements to the Ferguson Building and the Veterinary Centre. “Where I am cautious and what I do not wish to see is several years down the line for the SAC or the Scottish Executive to come back with further proposals for downgrading or closure. That will be as unacceptable then as it is now and I want to see Craibstone flourish as a centre of excellence for North-east agriculture training and support.